Please post related research information here. As of January 1, 2009, Aruba introduced a new legal entity, the Aruba Limited Liability Company (in Dutch: “Vennootschap met Beperkte Aansprakelijkheid”, hereinafter “VBA”). The VBA is a very modern and flexible legal entity. The VBA is especially designed to make Aruba more attractive for foreign investors and can be used in international company structures. In this newsflash we will inform you on the most important fiscal and corporate law features of the VBA. Lukoil VP: No Immediate Interest In Valero Aruba Refinery4-7-09 1:00 PM EDT | E-mail Article | Print ArticleNEW YORK -(Dow Jones)- Russian oil company OAO Lukoil Holdings (LKOH.RS) said Tuesday that it had no immediate interest in buying Valero Energy Corp.'s (VLO) refinery on the island of Aruba. "We're not interested," Lukoil vice president Leonid Fedun told reporters following a meeting with investors. Fedun said the asset would make a better fit with Lukoil's operations if the Russian major had a crude stream from Venezuela to refine. Lukoil is currently in talks with Venezuela on finalizing a production venture, but output probably won't start "for many years," Fedun said. 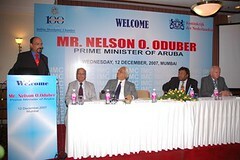 Mumbai (12/12/2007) - Mr. Nelson Oduber, Prime Minister of the island nation of Aruba, an autonomous state in the Kingdom of Netherlands, has invited Indian businessmen, investors and tourists to his country. Mr. Oduber addressed an interactive meeting organised in his honour at Hotel Hilton Towers, Mumbai by the Indian Merchants' Chamber on December 12. The Consul General of the Kingdom of the Netherlands, Mr. Hans Ramaker, introduced Mr. Oduber and other Ministers and officials of his delegation. Welcoming the distinguished guests, IMC President Mr. Niraj Bajaj complimented Prime Minister Mr. Oduber for leading his country to prosperity in the past 18 years of his office. “With a per capita income of over $28,000, the nation of Aruba has few parallels in the world,” he said. Prime Minister Mr. Oduber said that the population of Aruba – a 70 sq. mile island – was around 60,000 in 1986 and had now risen to well over 120,000. “Our tiny country with its beautiful beaches attracts over two million tourists annually,” he said. As such, the 19.6 mile long, 6 mile wide island nation had built three major ports, an international airport which could take large aircraft and exclusive airport for private aircrafts, a free trade zone, top class educational, healthcare and hotel facilities and all such modern infrastructure. Mr. Oduber invited Indian businessmen to set up bases in the Free Trade Zone of his country, add value to their products and re-export them to the US, Latin American and European countries. I spent time yesterday, and again today checking out things on Jen's list. I found an article today dated 1/29/2009 about Geolab. There is a mention of it being part of the Diamar Group....which I couldn't find anything on....just thought I'd mention it. Also found a few things yesterday, but not sure they are leading anywhere, yet. Edit to add I think it may be Diamar Spa, shipowners, transport, etc., located in Naples. GeoLab svolge attività di rilievi marini e servizi di supporto alle operazioni offshore. Fondata nel 1993 a Napoli, GeoLab nel 2002 è stata incorporata nel gruppo Diamar, gruppo armatoriale ed operatore marittimo di levatura internazionale. La sinergia che ne è derivata ha permesso a GeoLab di accedere ad una flotta di mezzi offshore intergruppo e di affermarsi nel mercato del Marine Survey & Positioning, fornendo servizi di qualità con l’impiego di tecnologie tradizionali e soluzioni innovative. GeoLab è inoltre diventata nel 2006 membro dell’International Marine Contractors Association (IMCA) per le divisioni Marine ed Offshore Surveying. GeoLab fornisce servizi “all-inclusive” di: geofisica marina, geologia e geotecnica, oceanografia applicata, ispezioni sottomarine, supporto alla costruzione offshore e rilievi ambientali, primariamente ai settori oil & gas offshore, collegamenti energia & telecomunicazione sottomarini, protezione dei litorali, ingegneria costiera e archeologia subacquea. GeoLab applica un Sistema di Gestione della Qualità secondo la norma UNI:EN ISO 9001:2000 con certificazione rilasciata dalla DNV (Det Norske Veritas) Italia. GeoLab prevede di conseguire entro giugno 2008 un Sistema Integrato (SGI) secondo le norme ISO 9001, ISO 14000 ed OHSAS 18002 anche per gli aspetti concernenti Sicurezza, Salute ed Ambiente. GeoLab provides services to the International Marine Market. Established in 1993 in Italy and subsequently incorporated in 2002 into the Diamar Group of Companies, a well-established offshore vessel owner and operator, GeoLab has grown into an internationally renowned Marine Survey Contractor for delivering quality results through proven technology and innovative solutions. GeoLab has joined in 2006 the International Marine Contractors Association (IMCA) for both Offshore Survey and Marine Divisions. GeoLab provides turn-key services world-wide, including marine geophysics, geology and geotechnics, applied oceanography, underwater inspections, construction support and environmental surveying primarily to the offshore oil & gas, submarine cabling, port & coastal, marine defence and underwater archeology industries. GeoLab implements a Quality Management System within the scope of UNI:EN ISO 9001:2000 with certification granted by DNV. GeoLab will certify (June 2008) their Integrated Quality, Heath, Safety & Environmental Management System (IMS) compliant to ISO 9001, ISO 14000 and OHSAS 18002 by DNV. GeoLAB carries out surveys and marine support services to offshore operations. Founded in 1993 in Naples, geoLAB in 2002 was incorporated into the group Diama, owner's group and operator of international shipping. The synergy that has arisen has allowed geoLAB access to a fleet of offshore resources intergroup and succeed in the market of the Marine Survey & Positioning, providing quality services using traditional technologies and innovative solutions. GeoLAB also became in 2006 a member of the Marine Contractors Association (IMCA) for Offshore and Marine divisions Surveying. GeoLAB provides all-inclusive "in: Marine geophysics, geology and geotechnical engineering, applied oceanography, underwater inspection, construction support to offshore and environmental relief, primarily to areas offshore oil & gas, energy & telecommunications links submarines, coastal protection, engineering coastal and underwater archeology. GeoLAB applies a Quality Management System according to UNI EN ISO 9001:2000 certification issued by DNV (Det Norske Veritas) Italy. GeoLAB expects to achieve by June 2008 an Integrated System (SGI) according to ISO 9001, ISO 14000 and OHSAS 18002 for matters concerning Safety, Health and Environment. GeoLAB provides services to the International Marine Market. Established in 1993 in Italy and subsequently incorporated in 2002 into the Diama Group of Companies, a well-established offshore vessel owner and operator, geoLAB has grown into an internationally renowned Marine Survey Contractor for delivering quality results through proven technology and innovative solutions. GeoLAB has joined in 2006 the International Marine Contractors Association (IMCA) for both Offshore Survey and Marine Divisions. GeoLAB provides turn-key services world-wide, including marine geophysics, geology and geotechnics, applied oceanography, underwater inspections, construction support and environmental surveying primarily to the offshore oil & gas, submarine cabling, port & coastal, marine and defense industries underwater archeology . GeoLAB implements a Quality Management System within the scope of UNI EN ISO 9001:2000 with certification granted by DNV. Address: 28A Berkley Street, Onikan, Lagos. “Veripos has been awarded a further three-year contract by Naples-based GeoLab Srl, one of Europe's leading turnkey offshore survey and construction support organisations, for provision of high-precision GNSS positioning services. There could be very important info in this PDF file....Go to page 2 see the mention of Coastal Aruba. Says are Meant to Intimidate It. (above). During his Sunday "Hello President [Alo Presidente]" program, Venezuelan President Hugo Chavez maintained that the purpose of the American military presence in the Caribbean is to "intimidate" his Government, and he warned that the "Bolivarian Revolution isn't afraid of the Empire." Chavez also announced that he would push forward a legal reform to increase taxes paid for the extraction of oil. -----------------------------"There are 6,000 sailors in the Caribbean and I don't know how many aircraft carriers and submarines. Just because they sail around the Caribbean with fleets they feel like putting there, they aren't going to threaten us, they aren't going to frighten us, we aren't afraid of the Paper Empire!" Chavez declared. The Venezuelan ruler argued that the presence of the United States Ambassador to Caracas, William Brownfield, "onboard and outfitted by the fleet," shows that "those military maneuvers taking place right here under our noses, are meant to threaten us." Brownfield has rejected claims that his country's military maneuvers in the Caribbean, as part of "Operation Partnership of the Americas," are meant to intimidate Venezuela. Taking part in the United States maneuvers, beside the aircraft carriers, are over a hundred combat aircraft, a cruiser, a destroyer, a frigate with missiles and 6,500 sailors, according to various sources. The American maneuvers, which began in April and will continue through May, are taking place in international waters and also within the waters of Curacao, Aruba, Jamaica, Trinidad and Tobago, San Cristobel and Nevis, among other Caribbean nations. Chavez insistently denounced the presumed intention of Washington "to invade" Venezuela to take over its reserves of over 3.15 billion barrels of oil (according to official figures). The White House denies the allegation. "If the United States thinks it can come here and enslave us, there will be nothing left for us to do than go to the mountains and to the neighborhoods and resist the aggression. We are preparing ourselves," the Chief of State reiterated during his Sunday program. Chavez accuses the Government of the United States of "Imperialism" and of "meddling" in Venezuela's internal affairs, while Washington calls the President of Venezuela "authoritarian" and a promoter of "anti-American" sentiment. Map and Graphic of the Orinoco Belt and Venezuela's Energy Resources. ----------------------------------------------------------------------------------During the program, Chavez announced he would push forward a legal reform to increase tax payments for oil extraction. "We are going to create a new oil tax, called the tax on extraction. Companies are earning a lot of money from the oil that they are taking from Venezuela," Chavez said, in regard to the international oil company partnerships operating in the country. Despite the announcement by Chavez that oil companies which produce heavy crude in the Orinoco Belt will pay taxes of 50%, rather than the present rate which is closer to 34%, he didn't precisely specify the new tax rate. British company British Petroleum Plc, American Exxon-Mobil Corp., Chevron Corp. and ConocoPhilips, France's Total SA and Norwegian Statoil, operate in the Orinoco Faja Belt. Executives of the state-run company Petroleos de Venezuela S.A. (PDVSA) said a short while ago that Venezuela wants to convert four heavy crude operations into "mixed enterprises." Chavez said that in 2007 the new tax would generate close to $1 billion in new revenue, without going into further details. Page created in 10.181 seconds with 19 queries.